Hey everyone I am new here to the forums but I desperately need some advice, I use my truck for the livelihood of my family my household and myself. I went to Auto School and worked in a full service shop for years, anyways I am rusty and I could have used years and years more shop experience. A few months ago (About 4) it began to overheat. I replaced the radiator and thermostat. I flushed the system and refilled it 50/50. Checked out the water pump, looked good. I took a 2-3 mile drive through the city, not to busy, when I got to my destination, no issues. When I return five minutes later, my truck has had an accident all over the parking lot. I could hear a slight hissing noise and there was steam and coolant leaking from my engine/firewall area, in the middle but slightly towards the passenger side. It stopped after a few minutes. I would say it only leaked about a half of a standard coolant container, maybe less. I started my truck and investigated for leaks with my accomplice. Nothing, truck was already at temp as well. So I carefully drove home and we watched for leaks, temp changes etc. Nothing happened. Cooled down, filled it up, bled system. Checked online for similar issues etc, nothing I could find. Put it in back of mind. I am driving home after about a 6 mile drive with a quick stop. I pull over to get gas. Notice smoke coming from engine compartment. Open hood thinking it's my PS Pump as it is leaky, recently, so much so, that I stopped filling it. Seems to be coming from rear of engine and passenger side. Figuring momentum, g forces, gravity, etc. brought some of the PS fluid to that area I shrugged it off for the most part. Checked oil, right on full since I filled it a month ago. Further reason for no further alarm. Depart the gas station. Mile or so down the road, temperature begins to climb, I think, thermostat about to open? Hmm, odd, should open flawlessly as it's practically new. Temp climbs to 2 thirds, drops to 1/2 (normal operate temp), continues to surge for five miles, never surpassing 3/4 and always returning to 1/2 within a minute or two. Get home, cry a little, having just purchased surprise tires right before a big trip notice truck is peeing coolant again from the same mystery location as before. Pop rad cap, fill it up, burp upper rad hose. Overflow tank at normal cool temp level. Start truck, continue filling while simultaneously checking for leaks. No leaks. fill up, burp. Use about 1/2 standard coolant container again, same as the other time this happened. Truck reaches normal operate temp and radiator is full. Notice wisps of white smoke coming from rear of engine, leaning towards passenger side. Coolant right? Except it smells like dirty oil. I leave engine on for 1 minute attempting to locate source... I hate how everything is crammed in there now a days, newer models are even worse, so needless to say I could have been blind and I may have come out better than I did. Shut truck off and restart internet scouring. Now I am here. Sorry for the read. My heater works. Coolant looks prime, no sediment, rust, discoloration, etc. Oil is free of bubbles, discoloration, rust, sediment, etc. One thing that happened AFTER the first coolant leak, about 1 month ago was my cabin fan went out. This is pretty simple to diagnose. it's apparent that you have a leak, could be the heater core or hoses or freeze plugs in the area. Your first step is to fill the system and then pressure test the cooling system to locate the leak. Definitely not one engine you want to overheat or have run hot. They had enough problems with head gaskets. Don't keep driving it until you find and fix the leak. If you keep driving it, you'll be sorry. Follow HT's advice. There are a bunch of heater hoses and the water bypass outlet back there leaks can come from. 3VZE is a PITA to work on. Pressure test and look harder for leak. Some can spray thru a pin hole leak only with pressure and show wet away from the source at something hot and or greasy fooling an odor diagnosis. Use mirrors and or whatever even paper if a fine line of coolant spray is fooling you for the source leak. I think a 94 should be fan and fan clutch and not deviate temp at all once warmed up and known full and now bet it has some air in system again. As it cools could draw air back thru leak instead of from recovery tank? Thanks for the replies! I couldn't find anything about a bypass online, quite disappointing. I will see what I can find with mirrors and lights. I am going to rent a pressure tester tomorrow. Thanks again will post update. This is the water bypass outlet housing and hoses on the back of the engine near the firewall. The upper intake plenum is removed for clarity. There is also a pipe that runs underneath the lower intake manifold that could rot out and leak. Coolant is probably spraying on the exhaust crossover and causing the steam cloud. Store in my area was out of the testers. Weather change killing peoples cars? haha. Thanks for those pictures those help me out. I will get digging once I get the tester. Got the tester. Two leaks. One small leak at the upper water outlet on the front of the engine (May possibly be the 'climate control outlet'), which looks like it could house a thermostat. Purchasing new water outlet gasket. Housing may be to rusty and need replacing. Two pinhole leaks in the heater core hose with many bends. I am going to attempt a fix with the intake manifold on first haha. I had a further question about the pic with all the sensors. Who can tell me what each one of those is? I think the previous owner removed one. Also wondering if one of them is just a plug/freeze plug or a secondary pressure release. If the previous owner removed one of the sensors, would a pressure release there be possible? I ask because the previous owner is notorious for installing backup pressure release valves and the pinhole leaks I found do not account for the large leak I described happening twice at temp. I understand that the damaged areas can expand and cause further leakage... but I don't see that as the cause. That picture I posted above is the same engine, but Toyota used a combination of sensors for different years and options. On yours you should have a temperature sender for the gauge. It is one wire that is yellow/green. 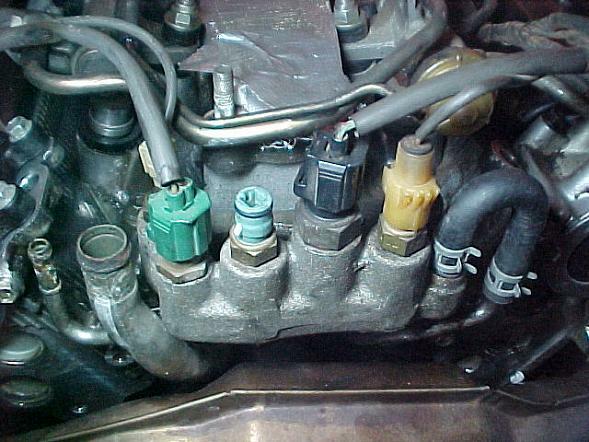 ECT (engine coolant temperature) sensor for computer with green/blue and brown/black stripe wires. Cold start injector time switch with brown/white or brown/yellow wires. It may or may not have a second water temp switch. I don't see it in the wiring diagram though. Why would someone put a pressure release else where on the system? The pressure release is built into the radiator cap. I really don't think someone would go through all the trouble of removing a sensor to install some type of release IMO. Maybe you could take a pic of your water outlet and the sensor arrangement and let us have a gander of what your looking at. Your guess as to why someone would put a pressure release back there is as good as mine. Self educated rednecks will do what they please; that's my guess. If it does have some sort of pressure release valve, you need to find out what pressure it is designed to blow off at. If it was me and I saw that, it would be coming off. Then you have to wonder why someone would stick that on there in the first place. Were trying to bandaid something or were they just being ignorant and thought they were working on a water heater. or were they just being ignorant and thought they were working on a water heater. 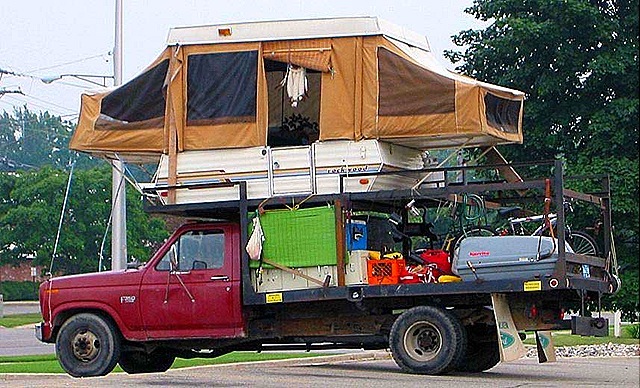 DS, maybe this was next on the list of upgrades. "Rev it up Bubba! The water isn't hot enough!" That's kind of a slick idea. I don't have a better way to come up with hot water on the road. Probably because the heat exchanger leaked internally and scalded people with hot antifreeze. HAHAHA all these comments are great. I was almost able to replace the leaking coolant hose, with the intake manifold on. I am a little annoyed, trying to get the hose clamp back on is hasslesome with the manifold still on as I expected. Will get it on there in the morning. O'reillys gave me the wrong gasket AGAIN, so the outlet has to wait. I am 90% ready to test the vehicle. It seems as though the water outlet gasket I need is non-existant. The water outlet, coming from the front upper engine area, to the upper radiator hose, needs a new molded almost rectangular gasket. I have been to all the auto stores in my area, with the outlet manifold. NO LUCK. No luck for 4runner parts, no luck with years 1989-1995. Is that even called the water outlet? We looked through complete gasket kits with an actually very knowledgeable (nice change for my area) employee at oreillys. Where do I find the VIN on a v6 3.0 1990s engine that fits in my truck? That's the only way I will find the proper gasket. 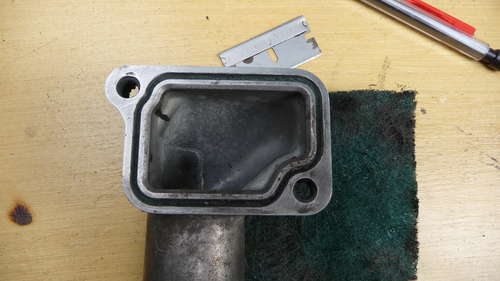 There is no gasket, even when they came from the factory. You have to use silicone sealant. Get the grey Permatex. You don't need to use a lot because when you tighten the outlet down you don't want globs of silicone squishing out and breaking off inside. Let the sealant cure before you fill it up with coolant. That is not a gap for a gasket. That is for sealant to fill in. Oh geez. Thanks a bunch, saved a trip to a dealership. Truck is back together, no leaks. Sprayed the area where the white smoke was coming from with Brakleen. No further smoke, I think it was from my leaking power steering pump. Filled and bled my cooling system, bubbles for five minutes or so after the thermostat opened. BUT, now my check engine light is on, for the first time since I have owned the truck (2 years now). I drove about five miles on a test drive, engine light on. On my return five miles, the check light was intermittent. Under the hood there is a diagnostic test port. Take a jumper wire and jump TE1 to E1 in the box. Then turn the ignition on. 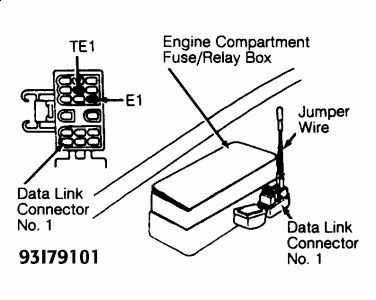 The check engine light will flash trouble codes stored. Let us know what the numbers are. The diagram for the test port is under the lid. That's a great trick to know.